There’s nothing like getting away with the girls for a few days especially when one of the girls is your sister. Kay and I just returned from our girl vacation to Lake Hamilton in Hot Springs, Arkansas. Jeff’s Aunt Kathy invited us to her home on the lake and offered her wonderful guest house for our stay. Here’s what we did with links and pics of some of the sights around Hot Springs and recipes we prepared and served for a girl’s brunch on the lake. Chapel at Garvan Gardens at dusk. You could actually hear the bells of the chapel across the lake at our guest house. Exquisite! Our first evening found us at a fabulous reception as Aunt Kathy’s guests at Garvan Woodland Gardens, the botanical gardens on Lake Hamilton, followed by a beautiful performance by Ballet Arkansas in the garden chapel. Our dear friend, Lauren, who dances with the ballet gave a stunning performance. 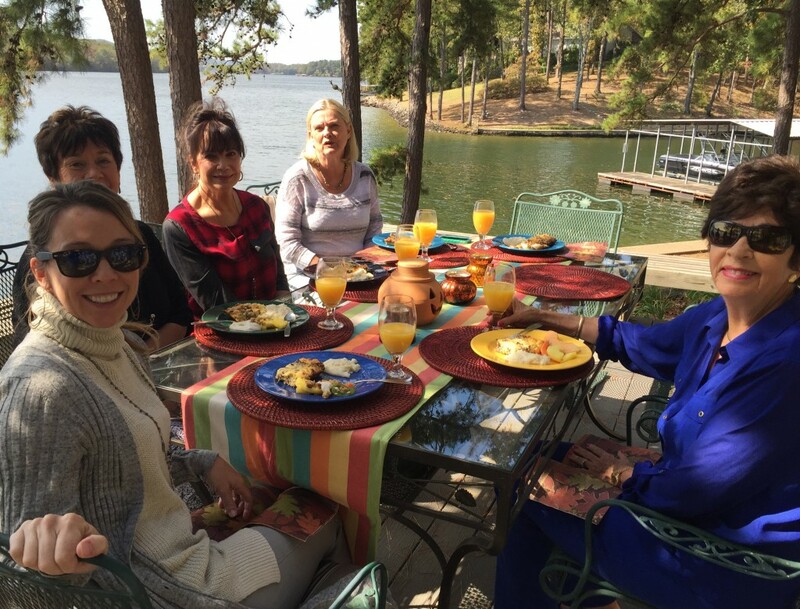 On Friday, Kay and I hosted a brunch on the lake for Aunt Kathy, Aunt Nellie, who flew down from Illinois to join us, and guests. MyMama’s Grits were on the menu. These are “THE BEST” grits and so very easy! I’ve always made them from memory but thought I would write down the recipe and share with my faithful followers. You’ll never cook grits right off the package again. **Kitchen Tip: Kay, brought a pineapple corer/slicer and had the pineapple sliced in nothing flat. I just bought one on Amazon for my gadget collection. Uncle Steve in the showroom of Resort Collector Cars and Trucks. This was the original location of Resort Ford in downtown Hot Springs. After our brunch, Aunt Kathy gave us a grand tour of Hot Springsincluding Uncle Steve’s Resort Collector Cars and Trucks showroom and restoration shop. That evening, we took a boat ride up the lake and were treated to a delicious dinner at Back Porch Grill by Aunt Nellie. Early morning on the guest house veranda. Notice Kay’s feet propped up and cup of coffee on the table. Now this is the life!! Kay and I left Saturday morning feeling pampered and rested. Bon voyage Hot Springs and Lake Hamilton! Thank you Aunt Kathy and Aunt Nellie! Can’t wait for the next girls’ trip! !